Fat Tuesday, Mardi Gras, Faschingsdienstag, Fattisdag! 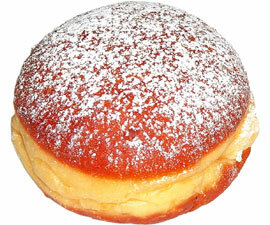 In Austria, the traditional Fat Tuesday food are hole-less donuts filled with apricot marmelade called “Krapfen”. 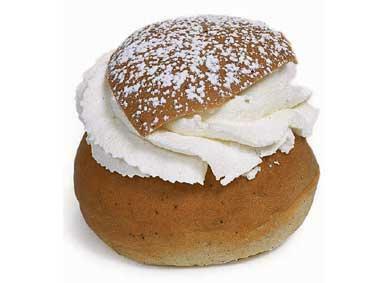 In Sweden, the traditional Fat Tuesday food is a yeast dough bun hollowed out and filled with almond paste and whipped cream. It’s called a “Semla”. Do you celebrate Fat Tuesday? What’s the traditional Fat Tuesday food in your country? Photos not by me. I found them on the web, sadly without source. Tomorrow is my first day at a new workplace. Since I have to give myself a little message (Ganbatte ne! Fight-o! and so on) and also, since I have to get up quite a bit earlier and after work, renovating a new apartment is on the plans for the evening, I packed a little breakfast box with leftovers for a good start in the day. 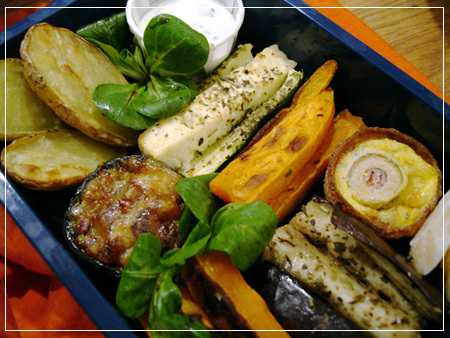 Potato halves, Maché sallad (I love this stuff), crème fraiche with chives to dip, a zucchini with a stick of feta, spiced sweet potato sticks, a mini-pie crust with some egg and half an olive, a few lumps of parmesan, eggplant with herbs, more sweet potato sticks, more salad and a mushroom stuffed with pesto, tomatoes and cheese. 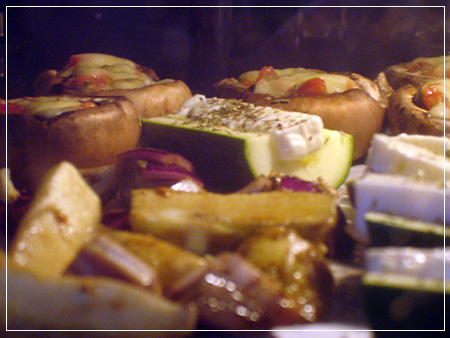 Organic check: The ingredients from organic production are: potatoes, sallad, zucchini, feta, parmesan (the last of the one I imported from Italy *sniff*), mushroom. Everything else I either had already or couldn’t find organic. 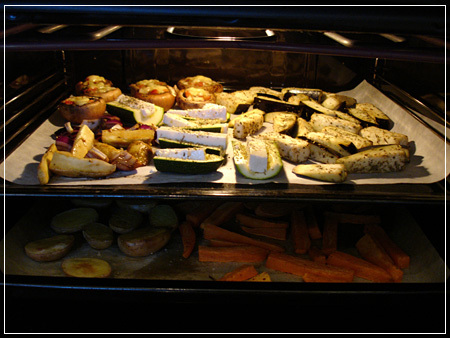 Everything in there that needed to be cooked was baked in the oven. The potatoes and sweet potatoes baked while I prepared the rest of the stuff, then I put the other veggies on a tray above it and when they were done, so were the potatoes. I can post recipes if needed. But for now, I’ll kick myself into bed so I can start my new work fresh and rested!